If you haven’t heard of designer Michelle Mason already you will probably recognise her work. Over the past few years she has collaborated with various companies including Universal Music, Transport for London, Southbank Centre, WovenGround and House of Fraser to create bold illustrative and typographic based print designs that have been used across many homeware and gift collections. Michelle’s bright, colourful style often takes inspiration from iconic British imagery which she translates into playful graphic illustrations across items such as wallpaper, wash bags, cushions, tableware, rugs plus many other homeware items. Her work has a fresh, vibrant feel and channels a quirky, retro style that is perfect for adding a splash of colour and element of fun in the home. I was lucky enough to work with Michelle whilst in my PR role at House of Fraser. I worked alongside her on the launch of Linea by Michelle Mason in 2011 / 2012 and saw her designs as they were being developed. The first range included street party themed cushions and tableware complete with bunting and cakes to coincide with the Golden Jubilee. 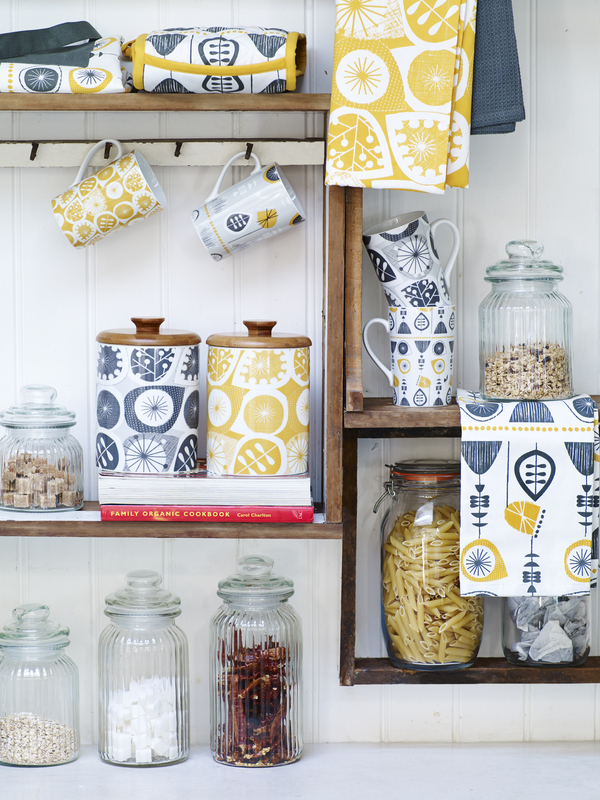 This season has seen the launch of the Linea by Michelle Mason ‘Seedpod’ collection, a kitchen range which takes inspiration from 1950s textile designs and looks delightfully retro in a yellow and grey colour palette. It was a pleasure to art direct the photography for both collections, which inevitably channelled a mid-century vintage vibe. The latest shot which was created for the House of Fraser SS13 Home brochure (shown above) was one of my favourites from the whole shoot, I love the mix-and-match vintage feel of the kitchen setting and how the product looks so at home. What’s new in your world this year, Michelle? Lots actually! Most recently has been the Linea by Michelle Mason Seedpod collection which has just hit down at House of Fraser. In January I launched a new range of wash bags featuring seaside designs which are really fun. I have also launched my first collection of wallpaper which includes two designs after collaborating with Universal Music and the National Railway Museum. The design for NRM is the 50s inspired ‘Beach’ wallpaper which features illustrated seaside scenes in gorgeous pastel colours. The design for Universal Music builds is part of the Decca Records heritage range I have been working on lately and features hand drawn stacks of catalogues in a mix of colours – blues, pinks, red, grey and white. The wash bags and wallpaper at available from Not On The High Street. What are you currently working on – is there anything coming up later this year or in 2014 that we should keep an eye open for? I’ve just finished the designs for a new collection with department store House of Fraser which will be launching in Spring 2014 under the Linea by Michelle Mason brand. I am also working on an exciting project for Transport for London which will come out later this year but can’t reveal anything about it at the moment! How would you describe your work to someone who has never seen it before? Illustrative with a bold graphic feel. Where do you find inspiration for your work? I was approached by the National Railway Museum a couple of years ago and they asked if I wanted to work with their archive of British Rail posters, so there was a lot of inspiration there. But generally the inspiration can come from anywhere. I made a lot of sketches of boats and things while on holiday last year and they ended up in this year’s collection. Are there any other designers whose work inspires you or that you like to follow? Lots of different designers inspire me really including many furniture designers. Also illustrators from the middle of the last century such as Edward Bawden and Eric Ravillous. I also like to keep up with the St Jude’s collective too – I’m a big fan of theirs. Where do you like to shop when you’re out and about? On the high street I think that House of Fraser has some great value and well designed homewares. I’m addicted to Le Labo perfume (Marylebone High St and Liberty) so I’m always getting my fix in there. In Paris I like to visit Merci, it has a wonderful cafe so you can stay there all morning after browsing through the store. In Milan, 10 Corso Como is very inspiring and also has a lovely cafe in a pretty cobbled courtyard. What has been the most exciting moment in your design career so far? I think every opportunity that’s come my way has been exciting and something to celebrate. I particularly like the current collection for House of Fraser, it’s just hit the shops this month and features some ceramic storage jars which I must get for my kitchen! It’s always rewarding to see the actual product in the shops a year after working on the initial designs.